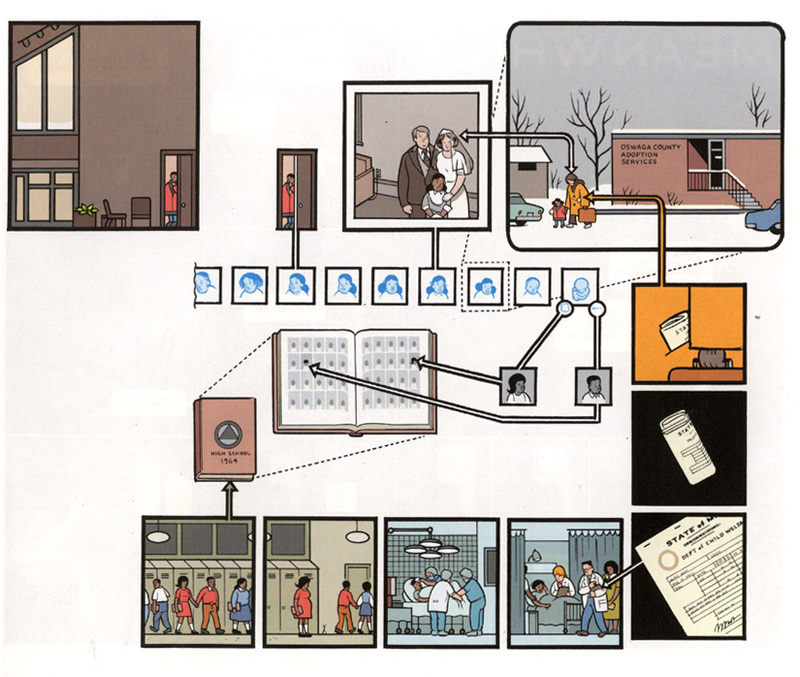 Reading: Beth Nissen on Chris Ware | "no words no action"
Catching up on some articles on Chris Ware’s work that were referenced in other texts that I’m reading, I was particularly interested to read these analogies from Ware about the structure of the complex and non-liner nature of his graphic novel Jimmy Corrigan. Jimmy Corrigan is undoubtedly one of the most complex non-linear stories every published. This non-linear narrative is evidently not a construct; it is also how the graphic novel was drawn, like a tree that grows in three dimensions and many different directions at once. Ware likens the fold-out book jacket to a web site. Complex web pages of different overlapping pages, sections and levels are frequently summarised in ‘site maps’. These attempt to ‘flatten’ an effectively three dimensional virtual space into a single flat atlas of interconnecting linked pages. It’s an old age solution to modern age technological problem: facilitating navigation in virtual spaces by applying a flat surface to explain and map it. An architect is normally employed to produce drawings that will determine the construction of buildings, usually on paper or on a computer screen. The plan of a building drawn by an architect will be many times smaller than the finished building. But the original comic strips produced by a comic strip artist will frequently be reduced before appearing in their finished published form. It’s not just a difference of scale, it’s a different approach to the connection between the drawing and the finished product.